The Samsung Galaxy Tab 4 NOOK Edition Is Really Cool! Full access to Google Play Store. Runs on Android 4.4 KitKat. Barnes & Noble was one of the leading players in the tablet hardware business a matter of a few years ago. 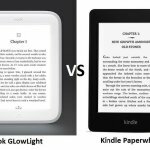 They have now decided to partner with Samsung and to otherwise cease manufacturing tablets apart from the GlowLight E Ink reader. can be considered as the first fruit of this collaboration with Samsung. There aren’t any major differences between Samsung Galaxy Tab 4 7.0 and the Nook edition in terms of hardware. Both these tablets are priced the same, too. However, the Nook edition comes along with a unique Android skin which is owned by Barnes & Noble. Also, you’ll get 3 TV episodes, a trio of e-Books, a dollop of freebies and some trial magazine subscriptions thrown in for good measure. is a solid 7-inch tablet that boasts some impressive features. You get complete access to the Google Play app store. It’s powered by the Android 4.4 operating system and features a microSD card slot which can be used to extend the storage capacity. The range of extras includes a TV remote and GPS. The 7-inch tablet has an elegant, understated aesthetic with marvelous curves. There’s a micro USB port at the bottom which can be used for recharging and a standard 3.5mm headphone jack at the top. 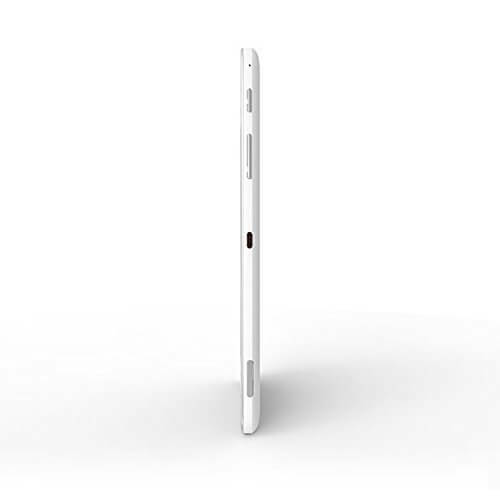 There is a physical home button, flanked on both sides by the capacitive back. App switching buttons are located on the lower bezel of this tablet. On the side of the tablet, you can find volume up and down buttons along with the lock switch. The microSD expansion slot is hidden near the bottom right-hand side. It is guarded by a flap to protect your microSD card. The IR sensor can serve as a TV remote. It’s tucked away on the side of the tablet. sThe NOOK measure 7.36 x 4.25 inches x 0.35 inches. It weighs a mere 0.6 pounds. is the first Android-based tablet that is optimized for reading purposes. The screen quality has played a major role in this. The 7-inch display is equipped with a resolution of 12800 x 800 pixels. Pixel density of 215 ppi. While some other 7-inch tablets have superior displays, the visuals offered by Samsung Galaxy Tab 4 NOOK Edition are more than fit for purpose. The screen reproduces all colors accurately and there’s no shifting when you tilt the screen at awkward angles. The Samsung Galaxy Tab 4 Nook is not the brightest tablet available but the display does have 429 lux. This is at least brighter than the 356 lux average. However, don’t expect the brightness you’ll enjoy with Amazon Fire HD. Since this is a mid-range tablet, you simply can’t expect high-end specifications from it. The Nook was only able to score 1,043 points in the Geekbench 3 general performance test when the average value of the category was 2,325. There’s a noticeable lag which can be seen when opening both Nook apps and other apps downloaded from Google Play Store but this is more of a mild annoyance than a real functional issue. The Samsung Galaxy Tab 4 NOOK Edition comes with Android 4.4.2 KitKat. That Touch Wiz overlay has enhanced the functionality of this tab as well. You can now experience the multitasking mode which is not found on Android 4.4 as a default feature. This mode allows you to split the tab screen into two and run two different applications at once. You can also customize the size of each partition according to your specific requirements. You’ll also be introduced to the Samsung S-Voice. This is a Siri-like voice-controlled virtual assistant. There’s no access to some other Samsung apps like My Magazine, though. The Nook Today widget will suggest content to you based on your past interests. You can also discover hundreds of different Nook channels along with relevant, curated content. The Nook Search helps you find content on the device and in the Nook Shop. You can view the most recently accessed content in the Nook Shop via Nook Library. Out of all features, the small book icon on the bottom left-hand corner stands out. Once you tap this icon, it will open the e-book that you are reading and automatically direct you to the exact place where you left off. You can also do this by touching the specific book you were reading in the library. Since this is an AndroAndroid-based you can also discover thousands of Android apps in the Google Play Store. However, some users will find the myriad options rather confusing. When you go to the Home page, you can see the Google Search bar offered by Android on the top and the Nook search bar at the bottom. There isn’t a big difference between these two options. There are 3 different setting applications. 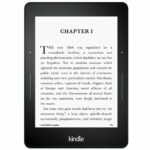 They include the usual settings option plus Nook settings and Google settings. The standard Android keyboard is in place. You can also download a third party app from the Play Store. Even though this is not a music edition tablet, sound quality is decent enough for you to enjoy your favorite sound tracks. is mildly tinny but more than adequate. The Samsung Galaxy Tab 4 NOOK Edition has a 3-megapixel rear camera and a 1.3 megapixel front camera. Any selfies taken from the front camera can be enhanced by Samsung’s beauty face feature. It will smooth a wrinkled face by creating an out of focus look. The brightness and color offered by the rear camera are better than most comparable tablets available on the market. The camera works best on sunny days. The camera capture videos in 720p format which is a nice touch. The Samsung Galaxy Tab 4 NOOK Edition has only 8GB of built in storage memory. However, half this memory is filled by the pre-loaded apps leaving you with little room for maneuver. Thankfully, you can expand this memory using microSD cards. 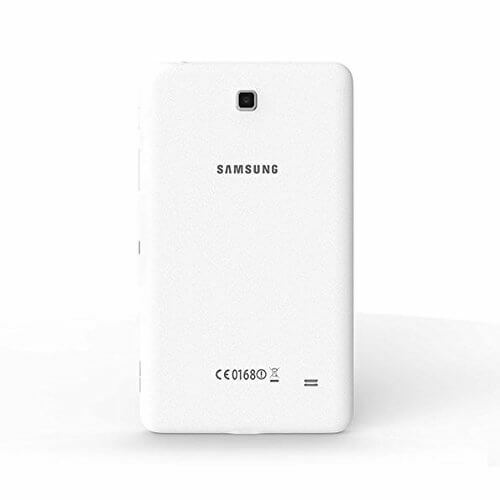 The tablet is compatible with microSD cards up to 32GB so you can instantly upgrade your storage capacity to 40GB. can also be considered as the reader’s edition of the device. Barnes & Noble has given all Samsung Galaxy Tab 4 NOOK Edition users the opportunity to swap eBooks with other users via the Lend Me program. You can also read e-Books free of charge within Barnes & Noble’s physical stores. There are thousands of free books with something for everyone. You can also find enhanced or interactive e-books within this store. When you are reading The Hobbit, you can hear J.R. Tolkien singing his English songs as an intro to the chapters. You can also find audio and video tutorials with some of these e-books. The Good Housekeeping Cookbook has some excellent videos. Last but not least, you can use this device to access a range of magazines. The Article View feature helps eliminate extra images and advertisements from the screen so you get only the right amount of text. The super-swift 3D-like pages offered in magazine view ices the cake. , you can access plenty of free content. This includes some of the most popular television shows, best-selling books and leading magazines. Beyond this, you will receive a top-up in your Barnes & Noble account which can be used to purchase anything you want. You can use this balance right out of the box without going through the hassle of adding your credit card. 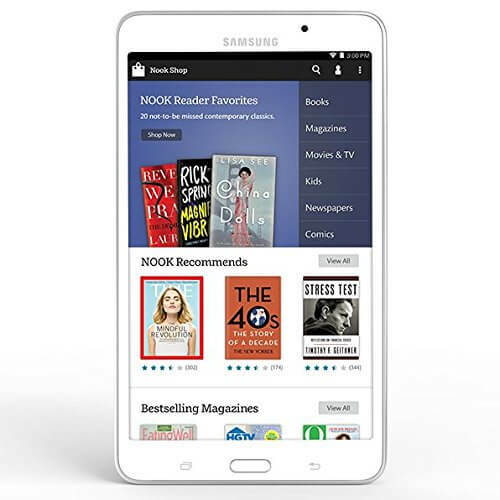 The Free Friday program from Barnes & Noble has also impressed many Samsung Galaxy Tab 4 NOOK Edition users. This program will give you a free Nook book, an app or a video every Friday. It is up to the e-tailer to decide what content should be there on your tab so this varies. The TV shows that come free with the Nook edition include single episodes from BBC America’s Orphan Black, NBC’s Hannibal and HBO’s Veep. If you are interested in free magazines, you will get a 14-day free trial period so you can decide before undertaking a subscription. Magazines include US Weekly, Sports Illustrated and Cosmopolitan. The world’s biggest digital collection of the best-selling US magazines is also owned by Barnes & Noble. Barnes & Noble has an excellent library with over 3 million e-books including more than 10,000 children’s books. Nook Comics gives you access to a wide variety of comics such as Dark Horse, DC Comics, and Marvel. You can also enjoy popular TV shows and movies for purchase or rent. 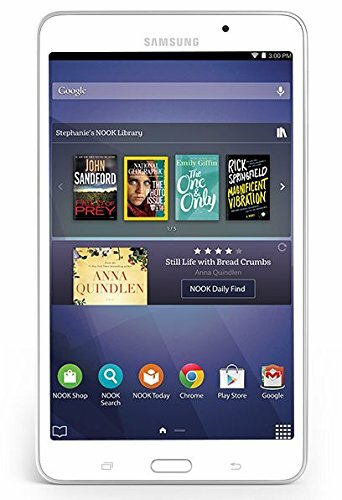 All these benefits come only with the Nook edition, so if you are interested in above offers, you should think of purchasing the Nook edition of the Samsung Galaxy Tab 4. 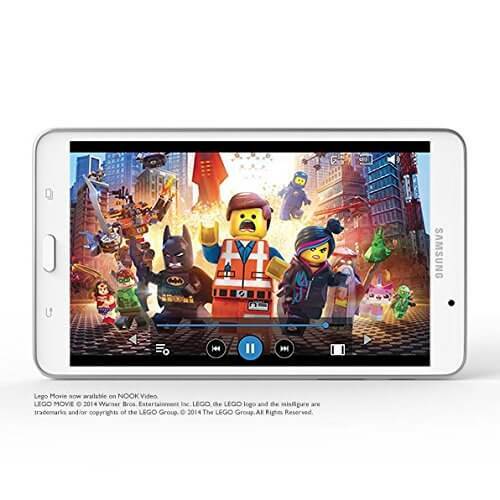 You will find the familiar Samsung App Store and Google Play Store on your Samsung Galaxy Tab 4 NOOK Edition. There’s also a curated store with only Nook-specific apps. This marketplace is known as the Nook Shop. The content offered by Nook Shop is family-friendly so there’s no need to worry about your kids flashing up inappropriate material. However, it lacks most of the general apps. You’ll be out of look using the Nook Shop for Facebook or WhatsApp. Once you activate parental controls, you will be asked to create a new password-protected profile for the device. The new profile can be added by going to the Settings menu. Then you can select the restrictions that need to be applied on the apps. Parents can also set maturity levels for television shows, movies and e-books. You can’t set time restrictions on your Samsung Galaxy Tab 4 NOOK. Battery life on the Samsung Galaxy Tab 4 NOOK Edition has played a major role behind the popularity of this Android tablet. Even though it has a large and bright display, you get a runtime of 10 hours and 40 minutes with continuous use. The battery life of this tab outflanks the Asus Memo Pad and Amazon Kindle Fire HDX 7. Battery life, of course, varies depending on usage and brightness levels. If you purchase a Samsung Galaxy Tab 4 NOOK Edition, you’ll get professional tech support from Barnes & Noble. However, there are only 660 Barnes & Noble bookstores nationwide. If you heavily depend on human support, check first if there is a Barnes & Noble store nearby. is an effective, no-nonsense tablet. Check one out today and enjoy a superb multimedia experience without spending a fortune. Drop us a line any time with your feedback or questions. We’re here to help! Can whatsapp be downloaded o to the tab 4, nook edition,? Yes if it runs Android, Whatsapp can be downloaded.